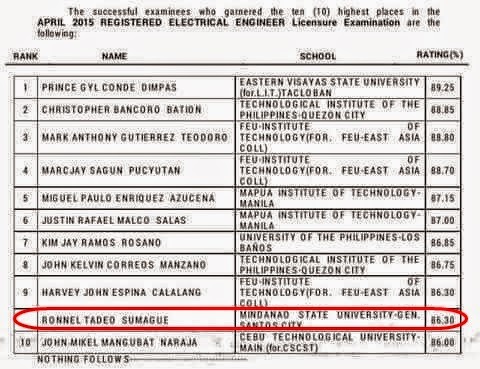 Mindanao State University- General Santos (MSU- GenSan) produced 10 new electrical engineers (100% passing rate) including a graduate who made it to the Top 10 of the April 2015 Electrical Engineer Board Exams. Ronnel Tadeo Sumague placed 9th in the said examination with a rating of 86.30. He was among 884 out of 1,886 who passed the Electrical Engineer Licensure Exam held in April 26-27 based on the results released by the Professional Regulation Commission (PRC). Read the full result HERE. With the 100% passing rate and a graduate in the top 10, MSU- General Santos once again proved that it is one of the country's finest state universities.